Sitting down trying to write something sensible after George Harrison's death from cancer is not easy. I guess all of us that are interested in music that is more than five years old, also have a relationship to George and the music he made. Beatles was the first music group that I knew the names of all its members, but George was the last of the Fab Four I knew - the quiet one allright. Today everybody says: "He was the quiet one, but we will remember him for his wit, his humanity and his musicality." Yes, that is what we will remember him for, but the George I will remember is the man behind the emotional guitar on Something and delicate playing on most Beatles tracks. I will remember him for the one bringing eastern music into western pop music. And a whole lot more: Listen to Love You To on 'Revolver'. The Beatles had already been flirting with eastern influences (notably on Norwegian Wood on "Rubber Soul"), but this was something completely different! So when Here, There And Everywhere follows, you just have to wonder if it is the same band! 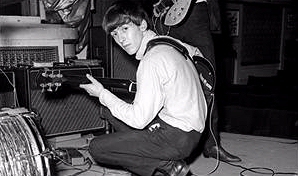 George had contributed to Beatles records as a songwriter earlier (check out If I Needed Someone and the harsh Think For Yourself and the guitar sound on the whole 'Rubber Soul' album), but on 'Revolver' he really started to add his musicality and ideas to the group. Would Tomorrow Never Knows sounded like it does if it wasn't for George? I doubt it. On 'Sgt. Pepper's Lonely Hearts Club Band' his song Within You Without You is one of the outstanding tracks. The next song on that album is When I'm Sixty-four... I guess you see my point. Of the five songs he made which ended up on 'The Beatles', it was only one truly great song. While My Guitar Gently Weeps is probably my favourite Beatles track ever. With its elegant chord changes, the arrangement, the lyrics it is a complete masterpiece though it is kind of hard to realize (and even acknowledge) that it is Eric Claptons lead guitar you hear. I have a sneaky feeling that some of Georges songs for The Beatles could have been worked out to be so much better than they are on the records. Listen to Only A Northern Song, It's All Too Much, even Not Guilty (which is one of the songs Beatles spent most time trying to record...). And George was the only one of the remaining Beatles to contribute something worthwhile to the two "new" Beatles songs with his slide guitar playing on Real Love that appeared on the 'Anthology' series in 1996.